This entry was posted in Books, Liberal Arts and tagged Aristotle, Edward Gibbon, Great Books, John Milton, Montaigne, William James, William Shakespeare. Bookmark the permalink. 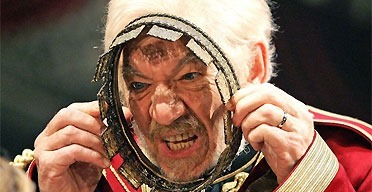 I haven’t seen McKellan’s King Lear, but his Richard III was excellent. I’ll make a point of watching Lear and let you know what I think of it. I am missing your progress updates, and I hope that this is just a break not a cessation of the 7 year program. You have come so far. I started with you about three years ago and then got lost in life. Now I am three years older, and back again. I have gone back to your first week in 2011 and read it last week, and I am on to week 2, 2011 by this Saturday. I regret not continuing then, but I wasn’t ready. Maybe now I am. I am also an educator so on my semester and summer breaks I am also going to get through the primary sources in the Great Ideas Today series (for Christmas Break I have 1961 on hold from the library), and maybe towards the end of the project the Annals of America (or make this a bonus 8th year). Here is the Great Ideas Today list for anyone who is interested: http://www.thegreatideas.org/git.html, I can’t find the Annals of America list online, but I am happy to post a PDF of it with Dr. J’s permission. Anyway I hope to see more posts soon–for what it’s worth, they do inspire and make a difference to me.